It’s been a long wait, five years in fact, but at last we have a follow up to Scared Bunny’s excellent 2003 debut, Disturbia. Rockwood follows on from that album, with similar influences like Pink Floyd, Tangerine Dream, and Hawkwind, and touches of classic rock, with more modern elements creeping into the sound with influences like Radiohead and electronica (though it’s playing on a guitar, not synths). But guitarist Vlad Skokovich, who is the sum total of Scared Bunny, has refined his style, it’s more focused, but with stronger melodies and more distinctive compositions. Utilizing nothing more than his guitar and effects, plus a Roland electronic drum kit and a “toy keyboard”, Skokovich still manages to sound like a full band, despite only being one musician. Things start off in an experimental way with Trance Am. With its alien sequence (played on guitar, I’m guessing), and strange effects whirling in and out, it reminded me a bit of early Ash Ra. From there we shoot through a lot of different moods and styles, but it still all hangs together nicely and retains that certain Scared Bunny quality. We get a little bit of everything, from the edgy space rock of tracks like Hopkins Jig and the explosive and freaked out Swirldown to the more melodic and acoustically inclined rock of Missing Sparks and In Vain? (though I presume Skokovich uses an acoustic emulator effect, as there are only electric guitars listed in his gear). Skokovich doesn’t shy away from space either, whether it be the cosmic textures he puts into a mid-tempo rocker like In & Out or the totally freaked out ambient experimentalism of a track like Roswell Black Box. But the spaciness is usually restrained, tastefully injected into the pieces rather than being the focus of it. A couple of outstanding tracks, in my opinion are Swimming Upstream and the title track, Rockwood. While keeping the pace upbeat, Swimming Upstream utilizes a lovely melancholic chord progression and some beautiful Old World European style guitar playing to great effect. The title track features a stunning, soaring guitar melody bolstered along by freaky effects in its latter half that take the song to the stars. The wait was worth it. 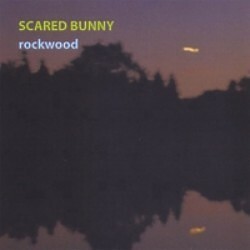 Rockwood not only doesn’t disappoint, but turns out to be even better than the first Scared Bunny album. Pure listening pleasure from start to finish. Highly recommended!